Dinner ladies and support staff have gone on strike over redundancy plans at a South Yorkshire school. Ladywood Primary School in Grimethorpe is planning to cut dinner ladies and use teaching assistants to supervise meals to save cash. Union Unison says it was given conflicting reasons for the changes. The school said it was not an easy proposal to put forward but it was "unable to operate within its budget" and had to review its staffing. 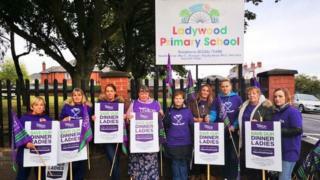 The 20 dinner ladies, teaching assistants and higher level teaching assistants stopped work on Wednesday and plan another five days of action. Unison says it was initially told the move was because teaching assistants were better equipped to monitor challenging children. But the union said it was later told the change was to save money. A Unison official said: "It's also unfair to expect the teaching assistants to pick up the duties of the dinner ladies - they are stretched enough as it is. "The school's plans simply don't add up and our members are concerned with how this will affect the children." In a statement the school said: "Our school is facing a significant budget shortfall for 2019/2020. "In the past, we've used different ways of limiting the financial impact upon the school without the need to consider reducing our staffing structure. "We've reached the point where we are unable to continue to operate within our financial budget and as a consequence, we've had to review our staffing structure." Further strikes are planned for 19, 20, 25, 26 and 27 September.